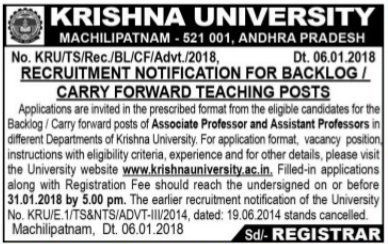 KRU Krishna University Assistant Professors, Associate Professors Recruitment 2018. KRU Recruitment, Krishna University Teaching Posts /Professors Recruitment 2018, KRU Professors recruitment, KRU Teaching Posts Recruitment 2018, Krishna University Teaching Posts Recruitment 2018 Online Applications are invited for the posts of Assistant Professor and Associate Professor in the Departments of KRU Colleges and Others. For the Registration, Submission of Online Application, eligibility criteria, Research Experience, Registration Fee and other details, please visit the Website http://www.sche.ap.gov.in/ASSTPROF/Masters/Home.aspx, go through the linked with KR University website: www.KrishnaUniversity.Ac.In. Filled in Online Applications along with acknowledgement of Registration Fee, can be downloaded and submit the same with all necessary documents to the Registrar, Krishna University, Machilipatnam- 521 001 on or before 31.01.2018 by 5.00 P.M.